Synthesis recipes are crafting blueprints in Kingdom Hearts 3. You’ll use them to create new items, like weapons, armor, accessories and potions at the Moogle shop. Before you can use a recipe, you’ll have to unlock it first. Once it’s unlocked, you’ll also need to gather the appropriate materials. 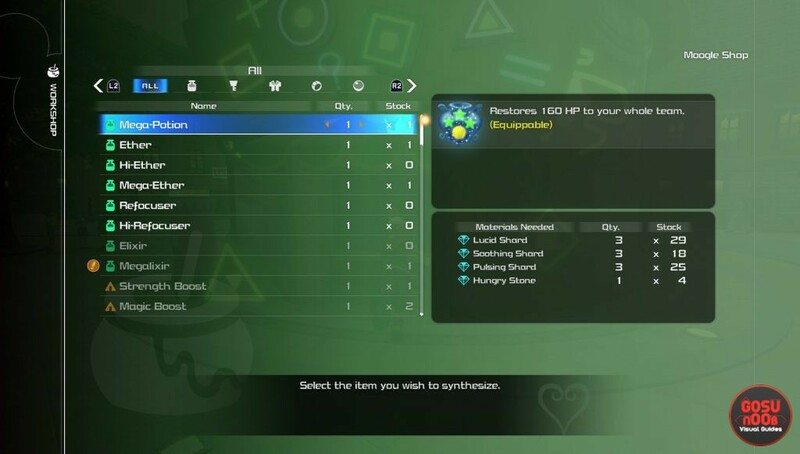 There are dozens of items you can create this way, and this guide will show you a list of all Kingdom Hearts 3 synthesis recipes. As you can’t really craft things until a recipe is unlocked, the following table is mostly informational. It’ll allow you to get a rough idea of how many units of each material you’ll need. If you see a link in the table, clicking it will lead you to a page that shows where you can find the material in question. Gear and consumables aren’t the only things you can craft in Kingdom Hearts 3. There are also advanced materials you can create by combining several of the regular ones you looted in the wild.